Private equity funds are pools of capital to be invested in companies that represent an opportunity for a high rate of return. They come with a fixed investment horizonReturn on Investment (ROI)Return on Investment (ROI) is a performance measure used to evaluate the returns of an investment or to compare efficiency between different investments. ROI measures the return of an investment relative to the cost of the investment., typically ranging from 4 to 7 years, at which point the PE firm hopes to profitably exit the investment. Exit strategies include IPOsInitial Public Offering (IPO)An Initial Public Offering (IPO) is the first sale of stocks issued by a company to the public. Prior to an IPO, a company is considered a private company, usually with a small number of investors (founders, friends, families, and business investors such as venture capitalists or angel investors). Learn what an IPO is and sale of the business to another private equity firm or strategic buyer. Institutional funds and accredited investors usually make up the primary sources of private equity funds, as they can provide substantial capital for extended periods of time. A team of investment professionals from a particular PE firm raise and manage the funds. Equity can be further subdivided into four components: shareholder loans, preferred shares, CCPPO shares, and ordinary shares. Typically, the equity proportion accounts for 30% to 40% of funding in a buyout. 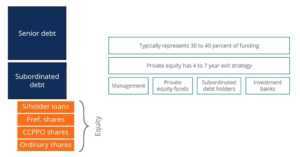 Private equity firms tend to invest in the equity stake with an exit plan of 4 to 7 years. Sources of equity funding include management, private equity funds, subordinated debt holders, and investment banks. In most cases, the equity fraction is comprised of a combination of all these sources. Private equity funds generally fall into two categories: Venture Capital and Buyout or Leveraged Buyout. Venture capitalVenture CapitalVenture capital is a form of financing that provides funds to early stage, emerging companies with high growth potential, in exchange for equity or an funds are pools of capital that typically invest in small, early stage and emerging businesses that are expected to have high growth potential but have limited access to other forms of capital. In the point of view of small start-ups with ambitious value propositions and innovations, VC funds are an essential source to raise capital as they lack access to large amounts of debt. In the point of view of an investor, although venture capital funds carry risks from investing in unconfirmed emerging businesses, they can generate extraordinary returns. Contrary to VC funds, leveraged buyout funds invest in more mature businesses, usually taking a controlling interest. LBOLeveraged Buyout (LBO)A leveraged buyout (LBO) is a transaction where a business is acquired using debt as the main source of consideration. An LBO transaction typically occur when a private equity (PE) firm borrows as much as they can from a variety of lenders (up to 70-80% of the purchase price) to achieve an internal rate return IRR >20% funds use extensive amounts of leverage to enhance the rate of return. Buyout finds tend to be significantly larger in size than VC funds. When does the exit need to take place? What is the investment horizon? Is the management team amenable and ready for an exit? What exit routes are available? Is the existing capital structure of the business appropriate? Is the business strategy appropriate? Who are the potential acquirers and buyers? Is it another private equity firm or a strategic buyer? What Internal Rate of Return (IRR)Internal Rate of Return (IRR)The Internal Rate of Return (IRR) is the discount rate that sets the net present value of an investment equal to zero. This guide to calculating IRR will give several examples and who why it's used in capital budgeting, private equity and other areas of finance and investing. If IRR is greater than cost of capital, will be achieved? When deciding to exit, PE firms take either one of two paths: total exit or partial exit. 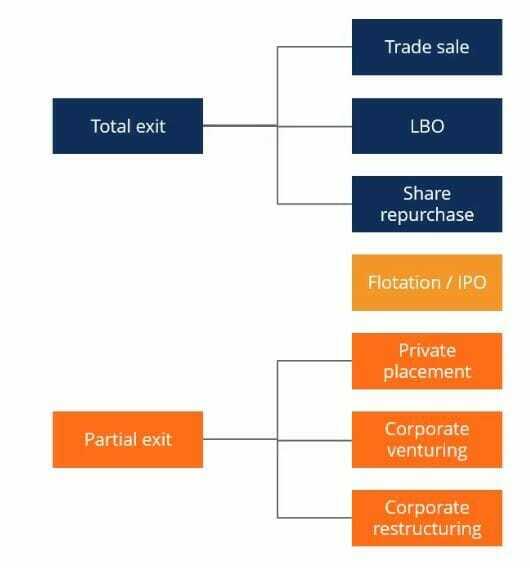 In terms of a wholesale exit from the business, there can be a trade sale to another buyer, LBO by another private equity firm, or a share repurchase. In terms of a partial exit, there could be a private placement, where another investor purchases a piece of the business. Another possibility is corporate restructuring, where external investors get involved and increase their position in the business by partially acquiring the private equity firm’s stake. Finally, corporate venturing could happen, in which the management increases their ownership in the business. Lastly, a flotation or an IPO is a hybrid strategy of both total and partial exit, which involves the company being listed on a public stock exchange. Typically, only a fraction of a company is sold in an IPO, ranging from 25% to 50% of the business. 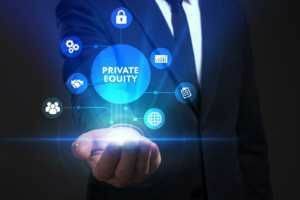 When the company is listed and traded publicly, private equity firms exit the company by slowly unwinding their remaining ownership stake in the business. Career Guide to Private EquityCareer Guide to Private Equity JobsThis career guide to private equity jobs provides all the information you need to know - positions, salary, titles, skills, progression, and much more. Private equity firms are investment management companies that acquire private businesses by pooling capital provided from high net worth individuals (HNWI) and institutional investors.